The Blue Primitive Area consists of about 175,000 acres on both sides of the Blue River in far eastern Arizona. It lies between the towns of Alpine to the north and Clifton/Morenci to the south. Today, the area is managed as a "wilderness", but in the late 1880's and early 1900's, there were as many as 300 people ranching and farming along the river and its tributary creeks. In September, my brother in law, Neil, and I backpacked from Highway 191 down to the Blue River. As we wandered about we came across these old ranch sites that may date back to those earliest days of settlement in the area. The adventure was about 28 miles in overall length and we spent the better part of four days wandering around. There was quite a bit of elevation and vegetation change from the trailhead to the river. The route started in the pines at 7000' and along the way we could see the transition to the junipers, mesquites and cottonwood trees at the 4600' elevation of the Blue River. We saw plenty of signs of deer and elk but no actual animals the entire trip. We did spook out a bear near the Blue River. There was also a recently dead lion carcass a few hundred feet from the first ranch site. At the time of our hike, we knew little of the history of the Blue Area. This ranch site is located approximately 4 miles west of the Blue River on one of its tributary creeks. I am not certain how far it dates back, but I have learned that it was purchased in the early 1920's by the son of perhaps the most prosperous rancher on the Blue River. At that time, it was estimated that the rancher was running more than 10,000 head of cattle on the Blue River Ranges. The son and his wife raised two boys at this ranch site. Everything had to be packed in. There was not enough water at the ranch site to have a garden. Once a month, the family would ride up to the "highway" to an old pickup. From there, they would drive into Clifton to go shopping. The nearest neighbors were at the Fritz Ranch many miles down the Blue River. There were apparently few visitors to the ranch only an occasional cowboy. Once the boys reached school age, mom moved them to Eagle Creek. Dad would try to visit once a month. The ranch was sold to the Fritz Ranch in 1941. Today it is owned by the Forest Service. The site seems to be maintained by visitors. There were approximately 20 groups who passed through in 2010 and approximately 10 groups through September of 2011. We used this site as a base of operations. There may have been a resident skunk under the floorboards. This old ranch site is located on the western banks of the Blue River. The brand was first registered by Hugh Mckeen in 1890. I am not certain that the location of these structures represents the site of the original ranch. 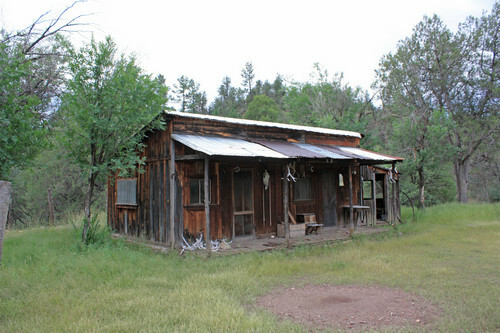 A visitor's log book states that this property is also owned by the Forest Service. The river at this location is very wide and the buildings are located on a tall bank. It does not appear that the river has ever gotten into the buildings or ranch yard. A small wash to the south has been bermed up to keep its floodwaters away. A road once existed in the bed of the Blue River. It connected the community of Blue to Clifton. Floods around 1904-05 washed the road out and it was supposedly never rebuilt. Was the native bed of the river used by vehicles in later times? I bet that it was. It would have been difficult to pack in the sheets of plywood and other materials seen here otherwise.